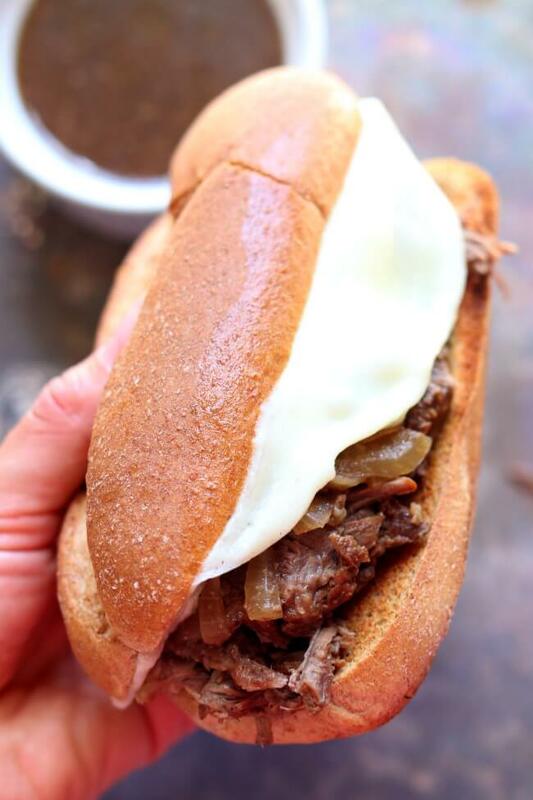 Instant Pot French Onion French Dip Sandwiches–The French dip sandwich is a hot beef sandwich consisting of tender thin slices of beef layered a long white French roll that is dipped into a flavorful sauce made from the pan juices. It is a staple at any diner in America. My recipe is a mash-up between French Onion Soup and the French Dip Sandwich. Soft onions are piled along with the beef and cheese on a crusty roll. I love cooking chuck roast in my Instant Pot. It turns out so tender in 30 minutes of cooking time (plus time to come to pressure and time to release pressure). 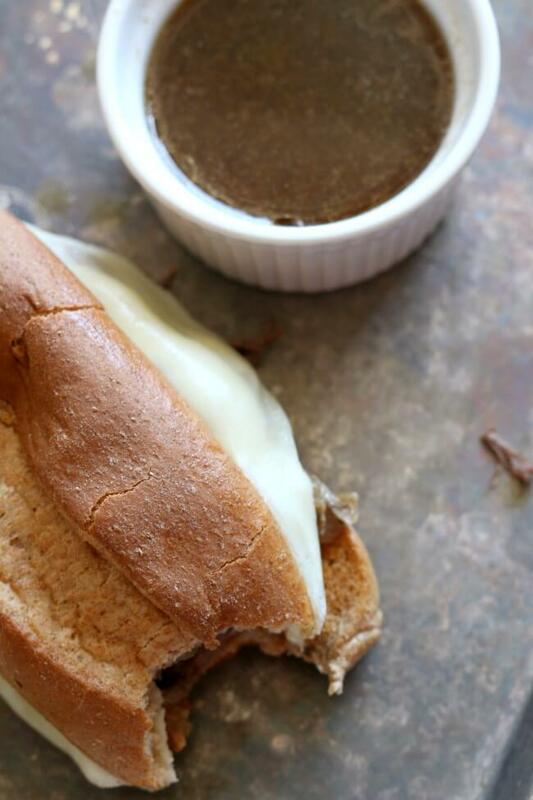 This instant pot french onion french dip sandwiches recipe is going to be a perfect summer meal. 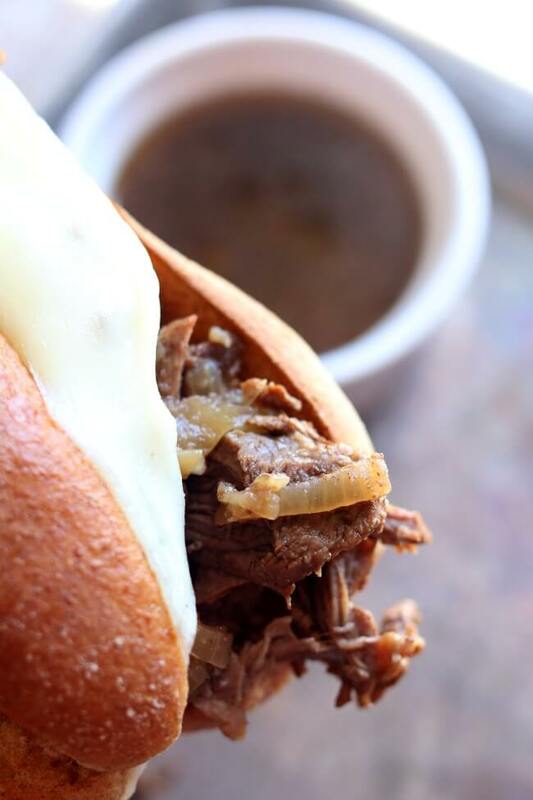 The onions and beef are cooked in the au jus sauce and get perfectly tender. Then the meat and onions are piled on crusty rolls and topped with melty cheese. I like to serve this meal with a side salad or some corn on the cob and fresh berries. 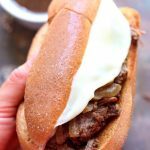 For this Instant Pot French Onion French Dip Sandwiches recipes I used this Instant Pot IP-LUX60 V3 Programmable Electric Pressure Cooker. It’s 6 quarts, so the same size as most slow cookers. It cost me around $80 on Amazon. The French dip sandwich is a hot beef sandwich consisting of tender thin slices of beef layered a long white French roll that is dipped into a flavorful sauce made from the pan juices. It is a staple at any diner in America. 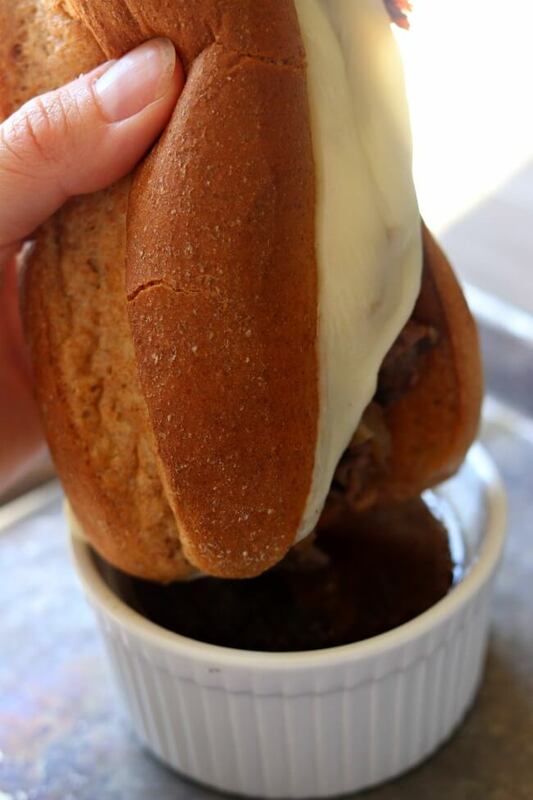 My recipe is a mash-up between French Onion Soup and the French Dip Sandwich. Caramelized onions are piled along with the beef and cheese on a crusty roll. Place beef** in the Instant Pot. Salt and pepper the beef. Add broth, worcestershire, onions***, garlic powder and bay leaf to Instant Pot. Let the pressure release naturally for best results. The meat will be more tender. Remove the beef and place it on a cutting board. Slice or shred the meat. Place a fine mesh strainer over a large bowl and pour the juice from the Instant Pot through the strainer and into the bowl. This juice will be your au jus, dipping sauce. The onions, in the strainer will be used on top of your sandwiches. Discard the bay leaf. Add meat back into the slow cooker. Salt and pepper to taste. Pile meat on top of rolls and use tongs to place onions on top of meat. Place a slice of cheese on top of the onions. If desired, place the roll with meat and cheese under the broiler so the cheese will melt. Serve sandwiches with a side of the reserved au jus. *You can also use beef chuck roast in place of the chuck steaks. Just quarter the roast before adding it to the Instant Pot. **For a more developed, meaty flavor you can brown the roast before adding it to the Instant Pot. Turn on the saute function to high on the Instant Pot. Heat 2 tablespoons of olive oil, add the meat and sear on all sides until each side has a brown crust. ***If you want a more developed flavor, caramelize the onions on the stovetop (or in your Instant Pot) before adding them to the slow cooker. Coat the bottom of the pan with olive oil. Heat the pan on medium high heat. Add the onion slices and stir to coat the onions with the oil. Spread the onions out evenly over the pan and let cook, stirring occasionally. The onions will develop a brown color. ****I used my Instant Pot IP-LUX60 V3 Programmable Electric Pressure Cooker for this recipe. This turned out so perfect, I nearly cried tears of joy. I couldn’t believe I could make a chuck roast taste so good. This turned out AMAZING! Everyone in the family loved it! We added fresh spinach for color. Definitely putting this recipe into the regular dinner rotation. Thank you from Hawaii! So glad you enjoyed it! Aloha! Made this for dinner tonight and it was a hit! Caramelized the onions as you suggested & wow. Actually got a complement on dinner, which very rarely happens. Thanks. If I have a 3 1/2 pound chuck roast would you increase the cooking time? Just quarter the roast and cook it the same amount of time. How would you use NY Strips for this? Cut in pieces prior to cooking? I’m sorry Amy but I don’t have any experience cooking NY Strips in the Instant Pot. From what I’ve read everyone says not to pressure cook them and to pan fry or grill them. Was this a thawed roast? yes, but you could also do a quartered frozen roast. same time. Next time I try it, I will reduce the cook time to 20-25 minutes. Question…. with the 30minute, high pressure on manual, what temp will this roast be once the IP is finished the NPR?